The 10 Best Sports Bars in Missouri! If you’re looking for great sports bars in Missouri, then you’ve come to the right place! 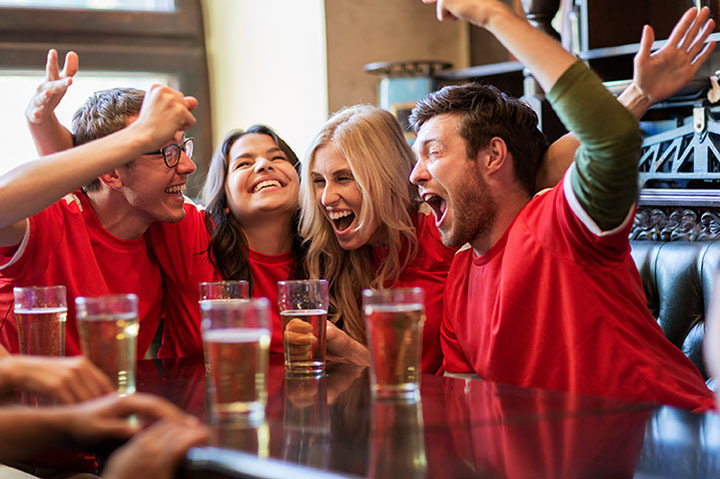 Whether you’re looking to watch the Chiefs, Cardinals, Royals, Blues, or you’re favorite college team, the sports bars of Missouri have the perfect atmosphere. Get ready to eat some great bar food and wash it down with a cold beverage or two. Here are our picks for the best sports bars in the Show Me State. You’ll find some of the best drink specials and nightlife in the area right here! You’ll find some of the best drink specials and nightlife in the area right here! With events happening every week night and with a happy hour that lasts seven hours from Monday to Friday, why would you want to go anywhere besides Crazy Craig’s Cheeky Monkey Bar in Branson? This popular spot is also a great place to gather after work as it features happy hour from 3-7 p.m. Monday through Friday. Not only has The Blue Line has been voted the number one sports bar in Kansas City, it’s also the city’s only hockey bar. This locally owned and operated sports bar is a Kansas City original! The Brass Rail Sports Bar is not just a sports bar but it also operates as a restaurant and sporting event venue. With features like billiards, darts, shuffleboard, and numerous HD TVs, the Brass Rail is one of the best sports bars in the Show Me State! Finally, a sports bar you can call home! Providing the perfect blend of a relaxing yet energetic atmosphere, the Post Sports Bar & Grill is more than just an experience with good food and drink; it’s a lifestyle. What’s the next best thing after watching the Cardinals or other area teams play live? It’s getting together with friends to catch the game at Brewhouse Historical Sports Bar in St. Louis! Located near Busch Stadium, this fantastic sports bar is filled with pride and energy for this city’s professional teams. Ugly Joe’s has been providing some of the best game day experiences to the Kansas City area since it opened in 2006. Ugly Joe’s features a great selection of games and over 30 flat screens. This sports bar serves a large variety of food, including 25 tasty appetizers, but it is best known for its homemade pizzas and fresh chicken wings. At Mattingly Sports Bar you’ll find every walk of life from blue collar to white collar and everything in between. Side Pockets provides a safe and comfortable place for patrons to actively enjoy darts and pool as well as a relaxing lounge area with delicious food, refreshing drinks, and sports on the big screen TVs. You’ll find good food and beverages as well as excellent service in a great environment here at Harbell’s! Kick back and relax while you enjoy a cold beverage and watch your favorite sports game. Harbell’s features some of the biggest TVs and the largest sports packages in Springfield, so they’re sure to have your game on when you want it. Hattrick’s is a friendly-owned and operated Irish sports pub that features one-of-a-kind pub grub from a scratch kitchen. The locals enjoy this spot for many reasons, including the $3 happy hour items.